....HOW ADVERTISING SPOILED ME....: Death of ideas! This latest project for Getty Images done by Heye Team. 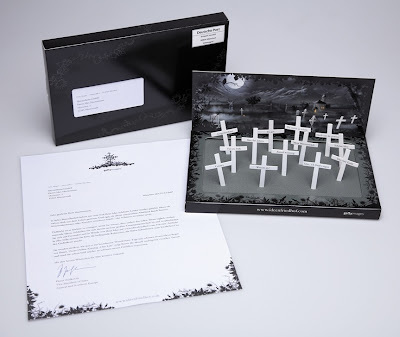 They sent out 7500 offline packets to promote the website www.ideenfriedhof.com. The website is only available in German, which speaks abou the death of ideas. The translated version of the letter reads "It is with deep sadness that we acknowledge the death of your idea. Beloved ideas are often torn from this world far too soon, and whether these unexpected farewells are at the behest of consultants, creative directors or customers, the pain is always real. Perhaps your grief will be easier to bear if you know that others share in it -thousands of ideas die each day. Join our large, grieving community at www.ideenfriedhof.com and commiserate with friends over the grandeur of your idea. To find peace, please use the enclosed memorial park, which will make your desktop a place of solemn reflection. You’ll realise how good it feels to let go. Wonderful days with beautiful new ideas lie before you. Our online catalogue ‘One Life’ will show you the latest and most important visual trends and will inspire you to fresh, stunning ideas. "